Embrace the Dark, and Stay Away from the Light. As we’ve discussed, dark chocolate has significant health benefits, especially when compared to milk and white chocolate. Although most mass-market chocolate does not contain as much of the good stuff of dark chocolate (phenylethylamine, flavonoids, antioxidants, and theobromine), it does contain some of these nutrients. Milk chocolate has less, and white chocolate has almost none. Go Nuts. Many people embrace nuts for their health benefits, including high protein and fiber levels, LDL-lowering fats, vitamin E, omega-3 fatty acids, and plant sterols. Halloween candy with nuts can fill you up and make you feel satisfied, so you are less likely to want to binge on your kids’ whole trick-or-treating bag. Be a Sucker. Lollipops and sucking candies, like Jolly Rancher and Werther’s Hard Candy, keep your mouth occupied for a longer time than something that you can quickly chew and swallow. 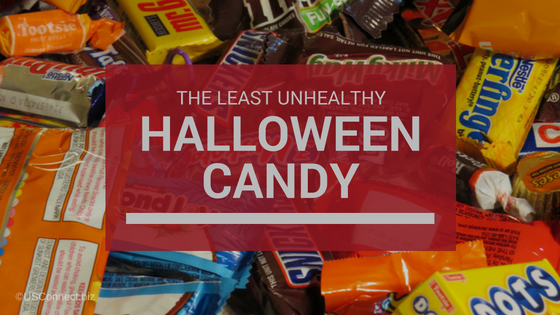 This can slow the constant hand-to-mouth feeding of Halloween candy. Read Before You Eat. Even if you don’t have the original back for checking nutrition data, this information is easily available online. Three Musketeers bars, for instance, have lower fat and sugar counts than Milky Way bars. If it’s otherwise a toss-up for you, go for the healthier choice! Check out TwoFoods.com as a nifty tool for comparing your Halloween candy. A further note of good news, as this blog has already discussed, portion control is a big part of making healthy choices. Most Halloween candy comes in “fun size” packages, designed for distributing to trick-or-treaters. Let this packaging work for you—helping you keep your indulgence to a minimum. Since the rise of the modern office building, the water cooler has been the place where colleagues congregate to discuss the topics of the day: the big game, the latest television twist, or weekend plans. Over time, the simple water cooler has evolved, and most workplaces contain some sort of break room/kitchen area where employees can refresh themselves, at least with food and drink. Make it pleasant. In the past, break rooms were created from leftover space with leftover furniture and appliances. However, it pays to invest a little to make your break room more attractive: paint the walls with cheery colors, provide artwork, and encourage employee participation by making it a place they will enjoy. Make it collaborative. Some of the most important skills in today’s world are communication, cooperation, and collaboration. Design your break room to encourage these skills by providing tables and groupings of comfortable chairs and couches. Make it healthy. Provide a range of food options (without excessive sugar or fat) to help satisfy employees’ hunger. USConnect’s The Right Choice … for a Healthier You™ program helps workers stay healthy by providing accessible nutritional information and an easy-to-find logo. Make it sustainable. If feasible, provide non-disposable dishes and cutlery and a sink for washing-up. At a minimum, provide recycling options. Sustainability is increasing important, especially among millennial workers. Job stress is a drain on worker productivity, not to mention happiness. 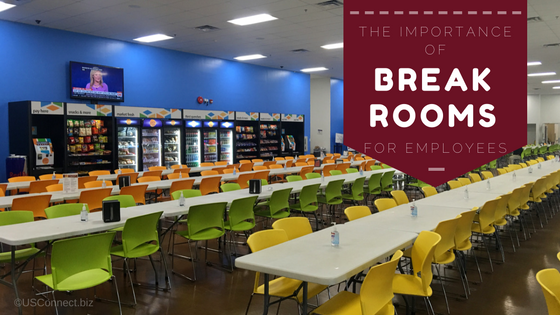 Lessen the load with a break room, and reap the rewards! 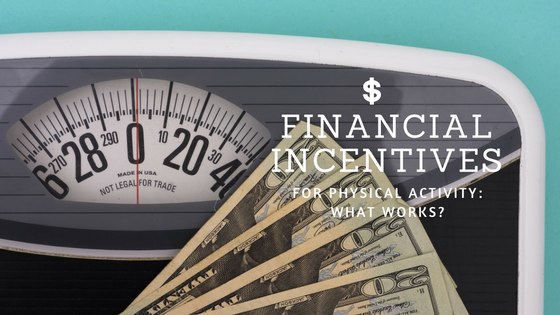 Financial Incentives for Physical Activity: What Works? How can organizations help keep their employees healthy? This is a question that has dogged company executives for decades, particularly since the 1980s when researchers first started tying workplace wellness programs to lower healthcare costs and higher employee productivity. That wellness programs have the potential to make employees healthier is undeniable. However, just having the program is not enough; employees need to participate, and they need to change their behaviors in order for the program to work. This is where the rubber meets the road, and it’s where many wellness programs fail to provide the hoped-for outcomes. A recent Rand Health and Gallup study found that in companies that provide wellness programs, only 24 percent of employees choose to participate. This can severely reduce the ROI of the program, no matter how well-designed it is! And a study from the Employee Benefit Research Institute (ERBI) found that late adopters of wellness programs were likely to be less healthy than their early-adoption counterparts, with more people at risk of diabetes, high cholesterol, and high blood pressure, as well as worse biometric readings and more expensive medical insurance usage. So, with a wellness program in place, how do human resources departments encourage participation, especially from those who need it most? Several recent studies indicate that financial incentives might hold the key: but with a caveat. A 2016 study from the University of Pennsylvania called “Framing Financial Incentives to Increase Physical Activity Among Overweight and Obese Adults” found that offering a positive financial incentive—i.e., giving additional money for participation—did not increase activity. However, offering a negative financial incentive—taking away money for lack of participation—resulted in a 50 percent increase in participation. The ERBI study cited above offers hope as well; although unhealthy and overweight people were less likely to join wellness programs without incentives, financial incentives did increase participation and encourage a favorable response. It’s important to note that wellness programs cannot be mandatory, and the U.S. Equal Employment Opportunity Commission (EEOC) forbids discriminating against employees based on their health or genetic makeup. 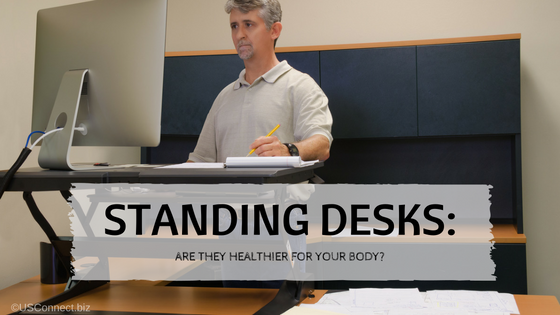 Are Standing Desks Healthier for Your Body? Working Americans spend an average of six to 10 hours a day sitting, usually in front of a computer. But how to work without sitting? Enter the standing desk, touted by many as a cure-all for the problems that prolonged sitting brings. Custom standing desks are available for thousands of dollars, or homemade ones can be fashioned from planks, books, and other household items. That being said, research shows that replacing sitting all day with standing all day is not ideal either. Standing for long periods can increase lower back pain, decrease concentration on certain tasks, and result in enlarged veins. The key, it seems, is movement and moderation. Going back and forth between sitting and standing during the course of the day is much more beneficial than choosing one position and staying in it for eight hours. Many people are now choosing convertible sit/stand desks that allow for that flexibility, and adding accessories like anti-fatigue mats to reduce pressure on legs.